On 6th and 7th November, Ema Sullivan Bissett organised a conference on Belief, Imagination, and Delusion at the University of Birmingham. But, surely we can imagine all sorts of things, and not thereby act upon them? Acknowledging this thought, Ichino brought up O’Brien’s example: Lucy can imagine being an elephant, but this does not entail all of the behavioural outputs that believing that she was an elephant would promote (for instance, resigning from her job, and withdrawing from interactions because she is no longer able to comply with human social norms; buying a new bed because elephants do not fit in human beds… etc). But imaginings like these are not similarly integrated into a network of cognitions as the equivalent beliefs are. Ichino’s challenge to us and to you: Find a case where an imagining does not motivate, where, all else being equal, a belief with the same content would. Can you think of one? The second day of the conference started with a talk by Kathleen Stock (Sussex). The question guiding the talk was whether some delusions are also imaginings or involve imaginings. Stock reviewed Currie’s view of delusions. Currie makes a distinction between beliefs and propositional imaging. To imagine that something is the case and to believe that it is not would not be contradictory. In this sense, propositional images are isolated from other beliefs. Situations where a person does not believe that is imagining that p, but rather believes that she believes that p can be explained appealing to an inability to appropriately monitor one’s act of imagining. 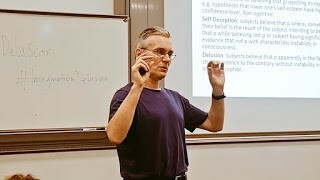 Jakob Ohlhorst (Geneva) gave a talk on “The Certainties of Delusion”. He provided an argument for defending that delusions are a kind of certainty. He started his talk by defining delusions. As presented in the ICD-11 (2018), delusions are epistemically and practically dysfunctional beliefs that are firmly held despite any evidence against them. Ohlhorst went on following Wittgenstein and defined certainties as deeply held beliefs that are constitutive of a world-view. As such these are beyond evidential confirmation or defeat. Parrott offered and alternative account that un-understandable delusions are such because they presuppose unimaginable inference principles. He first showed that suppositions are constrained by background inference principles, and that there are certain things that we cannot suppositionally imagine. Accordingly, to suppose that p you must have some way to discharge the supposition that p, and without some sense of what would count as discharging it, one cannot suppositionally imagine that p.
This was a very rich and interesting conference with a welcoming and friendly atmosphere!